So today I did the Lap the Lake 5km fun run around the Penrith Regatta Centre..
My official time is in and I did my 5km in 41:12 YAY ME! As always I had an awesome time catching up with some of my wonderful fitness buddies. I am constantly amazed at how much I love these events.. who would have thought that I would be excited to “run” 5km… 12 months ago it was a totally different story….I dreaded the thought …….. and the Lap the Lake event is one of the reasons I used to believe that I would never be able to run.. 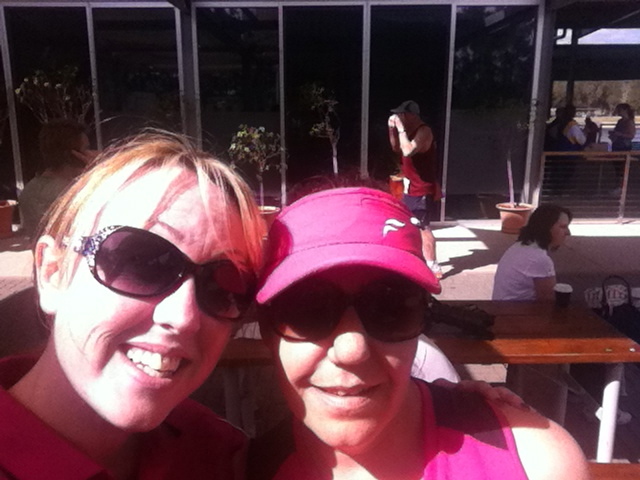 I met up with another 12wbter was in training to do the 5km and agreed that I would meet her there on the day, I jumped online and registered I downloaded the Couch25km app for my phone and started planning my training…. THEN it came time for my first Fitness test for the 12wbt program – so the first part of the test is the 1km time trail … Ok so had been doing this running training for a few weeks & I was walking a 7km track a few times a week, so a 1km time trial – easy peasy.. I could do that no problems, right? – WRONG!! it took me 12:30 and I was exhausted after running the 1st 100mtrs and had to stop running and finish the rest of the time trial walking while trying to regain my breathe and cramping up from a massive stitch.. What a wake up call that was!! Who the hell was I trying to kid! !… I couldnt even run 100mtrs, 5km was NEVER EVER EVER going to happen. I admit that I gave up then and there I gave up on doing on the lap the lake in fact I gave up on the idea of ever running.. How could I ever be a runner, I had spent the past 18years as an overweight physically inactive slob.. I did not like me, I did not like the person I had let myself become, I was stuck in the yo you dieting cycle, stuck in the same negative headspace. Fast forward 12months, with 3 ½ rounds of the 12wbt under my belt, a focused and positive mindset, and the most important difference is ME,. It has taken me a long time to LOVE me, to LOVE the person I have let myself become, and to LOVE and embrace and welcome new challenges, and to LOVE that I am out there doing it. I still cant run 5kms without stopping but you know what WHO CARES?? NOT ME!! 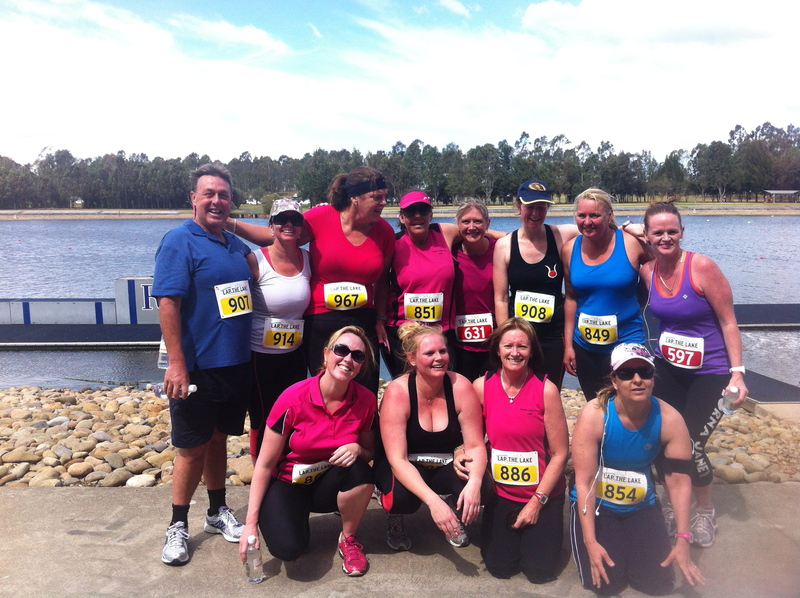 Woo Hoo another Fun Run done and dusted….. 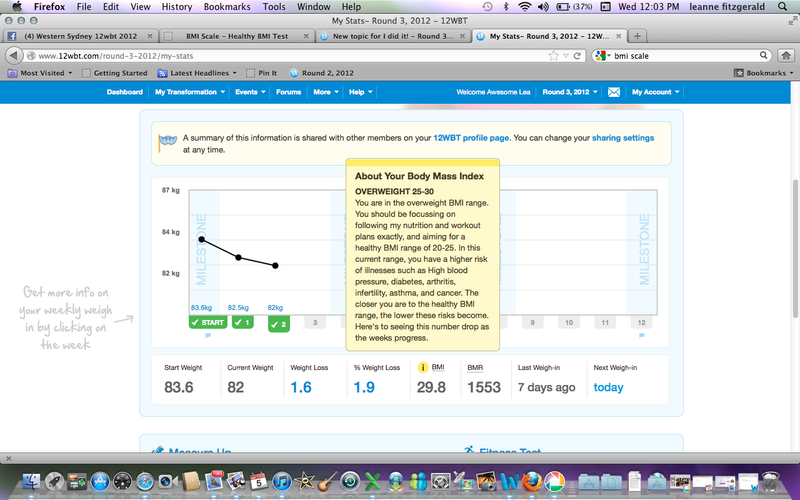 I am so excited, to be classed as overweight in the BMI scale,. For the past 2 1/2 years I have been slowly and steadily losing weight, I have lost almost 30kgs, and every week after I weigh in I check my BMI, It is the one thing that has not changed, I have always been in the OBESE range. I have been getting a little bit obsessed with it as I have been right on the borderline for the past few weeks, but after todays weigh in, and a loss of 500grms… it finally happened… I AM NO LONGER OBESE.. I am JUST OVERWEIGHT!!! I now have a BMI of 29.8 .2 under the obese range….